At Great Plains Auto Body, we’re committed to giving you an unmatched level of service. As a company that’s been family owned and operated for more than 25 years, we’re dedicated to treating our customers as we would treat members of our own family. As an auto body shop in Omaha & Council Bluffs, we strive to provide the best customer service in the area. In doing so, we feel it’s important for you to get to know who you are working with. 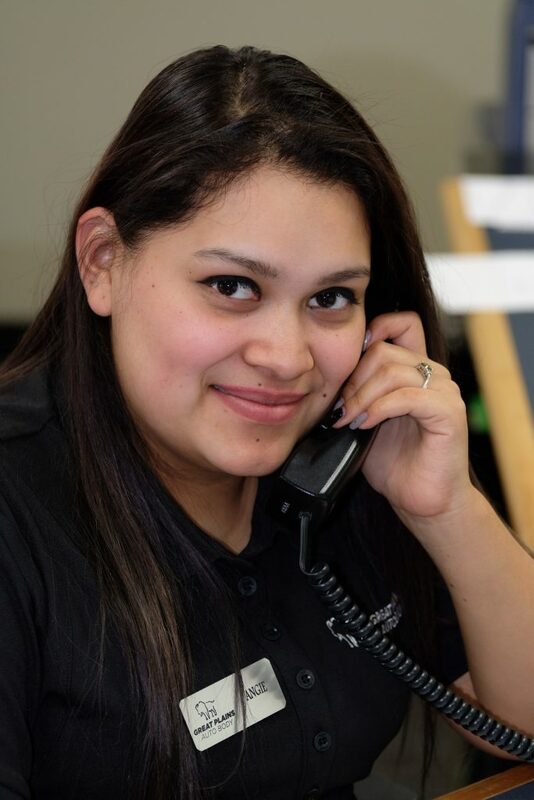 Today, we get to know Angie Calderon Sandoval, a customer service rep at our Grover street location. I was born in Omaha, NE. However I have a strong Mexican heritage. My parents are both from Morelia, Michoacan! (Morelia is the capital of the central Mexican state of Michoacán.) I love the culture, all the food and traditions. They are a very special part of my family and history, I love to celebrate! I have a beautiful family of 4 with two kids ages 7 and a 3 months. I’m also blessed to have an Angel Baby in the sky looking over me. I love to spent time with my family & watch movies! I also love to listen to music & draw. Its something to relax me when I’m stressed out or feeling over whelmed. How will you help our Spanish Speaking Clients? Having the ability to assist and communicate with our Clients will help them better understand the repair process. This also allows consumers the ability to express their concerns and ask any questions they have. Why should Spanish speakers come to GPAB? I want all of our customer to know their repair will be done with the highest standards. Sometimes when there is a language barrier it is difficult and frustrating for everyone involved. My ability to help our Spanish speaking clients communicate makes them feel better about leaving their car at Great Plains Auto Body. They can ask questions and get timely updates without the stress of a language barrier. Having customer satisfaction is one of our main priorities. We respect all of our customers, and we are positive you will be pleased with the results. During the repair process, we will provide you with regular updates on your vehicle’s status as we work to return your vehicle to pre-accident condition. Conveniently in four different locations, we are accessible to anyone in the greater Omaha & Council Bluffs area. Some might go so far as to say we work magic. In a way, we guess we do, making undesirable dents, scratches, bent wheel rims, and more new again. But, really, we just do the job right the first time, so that you don’t have to deal with yet another headache. What Makes Great Plains Auto Body Shop Different?